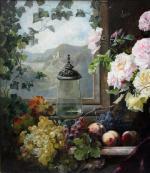 Monumental masterfully still life with roses, fruits nd antique glass jug in front of the window with view of Austrian romntical ruins of Duernstein. This painting was executed by famous Austrian painter and singer Franz Xaver Birkinger Birkinger (1833 Augsburg - 1906Vienna). Training in Munich and Paris; then settled in Vienna. Participated regularly in the annual exhibitions of the Viennese art Union Künstlerhaus, whose member he was from 1884 and he left bequeathed 12,000 crowns. Occasional stage singers, then return to painting. Extracts. : A.O. 1891 Honorary-Diplom in the World Exhibition in Barcelona; the excellent work was purchased by the local Mus. De Arte MoDerne. 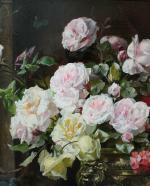 Birkinger painted flowers still life, besides landscapes with animal staffages (forest landscape with deer), idylls from the peasant Milieu and humorous genres. Exhibitions E: 1907 Vienna, artist union Künstlerhaus: Estate-exhibition. Literature: Prof.H.Fuchs, Lexicon of Austrian artists, Vienna, 1975; Thieme/Becker "Allgemeines Künstlerlexikon", Leipzig, 1999. Technique: oil on canvas. original period gilt frame. 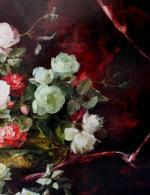 Measurements: unframed w 49 1/4"x h 25 2/3" (125 x 65 cm), framed w 55 1/8" x h 31 1/2" (140 x 80 cm). Condition: in good condition, canvas was professionally relined.